In order to use RBE for any modification on the BIOS, you first have to save your BIOS off your video card. What you are getting there is a BIOS image file having a file name extension ".bin" or ".rom". The contents of .bin and .rom files are identical, it is just a naming convention. For using ATIFlash, you will first have to make a bootable device booting to real DOS. This can either be a floppy disc, a bootable USB-stick, a bootable CD or DVD, a bootable ZIP-drive, a secondary hard disk or anything that is able to boot your computer. If you have your bootable device ready, put ATIFlash on it. Then restart your machine. Maybe you will have to get into the CMOS setup and tell the computer to boot from your new bootable device. If you managed to boot your computer to DOS from your device, you will see a black screen with a blinking white prompt in text mode. When being here, you should type "ATIFlash -i", without the quotation marks, respectively, and press enter. You should get a list of all found ATI adapters (video cards). Take a look at the ASIC column. You can see your GPU chip here. For example, if you have a HD 3850 or 3870, you should see something like "RV670" there, if having a 4850 or 4870, you should see something like "RV770" and if you have a 2900 XT for example, you will see a "R600" chip. In the first column, you can see the internal ATI adapter number. If you have one video card only (most common case), the adapter number should be 0. If having two or more cards (Remember: A 3870X2 or a 4870X2 is actually two cards as it has two BIOSes and thus, two adapter numbers for ATIFlash. ), the adapter numbers continue at 1, 2 and so on. Enter "ATIFlash -s 0 BIOS0.ROM" then to save the BIOS from the card with adapter number 0 to a file called BIOS0.ROM. If you found more than one adapter, enter "ATIFlash -s 1 BIOS1.ROM" and so on until you saved off any BIOS from any adapter. Restart the machine then, go back to the CMOS setup, set it to boot from your normal hard disk and boot to Windows, then. This method is more comfortable. Just download WinFlash and run it. In case it won't come up, you're unfortunately left to one of the other options acquiring your BIOS because WinFlash is reported to be incompatible with several OS-/driver combinations. If it runs well, just select one video card after the other (or don't do anything if you have one video card only), click the "Save" button and save your BIOS file to any location you like. *Caution*: If you have a 4870 or 4870X2 using GDDR5, a BIOS saved off using WinFlash will be corrupted! Don't use WinFlash in that case. The most recommended method to acquiring your BIOS is using GPU-Z. It is compatible with any recent Windows version (so you won't have any problem with WinFlash not coming up), very comfortable, assured to not corrupting any BIOS file and has many many other nice features. It is a must have for any video card fan. Just run the program, select your video card using the combo box at the bottom of the program's window (or skip that if you have one video card only) and click on the tiny button right next to the "BIOS Version" line. Select "Save to file..." then and save the BIOS to any location you like. The first thing you need to do here is telling RBE where your WinFlash is located. You can use the "Search" button for that. Clicking it will cause RBE to search the entire system for WinFlash, so it will take some time. Otherwise, just click the "Browse" button and tell RBE where to find WinFlash directly. After that, click the "Analyze" button at the bottom of the window. Please note that in case you used the search function, the analyze procedure is fired up automatically to save you some time. The most common case is that there is only one card found as most users have only one. In case you use more than one card, you will have to pick the card which BIOS concerns you with the radio button on the right. The card found at adapter ID 0 is being selected automatically, so users with only one card won't have to think about this, of course. After selecting the card of your concern, click the "Acquire this BIOS" button. 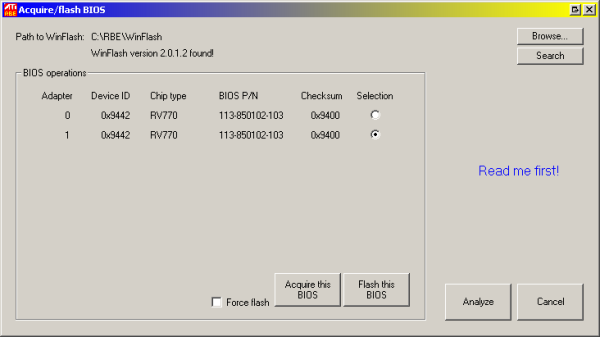 RBE will use WinFlash then to extract the selected card's BIOS and load it into RBE directly. 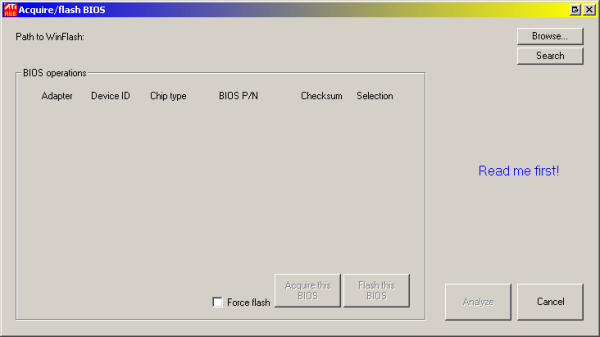 The "Acquire/flash BIOS" window will close then and present you the RBE main window again. Please note that for some cards, WinFlash does produce corrupted files. This holds here as well. You shouldn't use this in case you have one of those cards. See 2.2 for details. Windows Vista users, please be sure to have WinFlash to run with administrator privilegues for this. 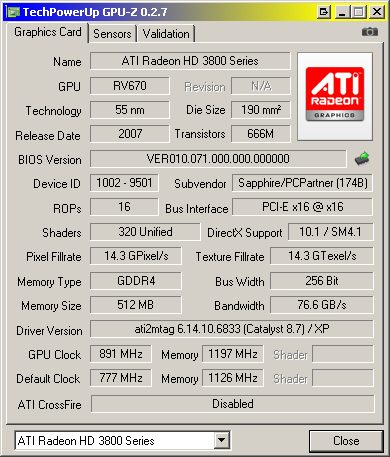 Other programs like ATITool and RivaTuner can save the BIOS off the card as well. However, those programs still have problems with the most recent video cards (4870 for example), so it is not recommended to use those programs at the moment.